Together with Maximinus he joined the chorus of Martyrs. 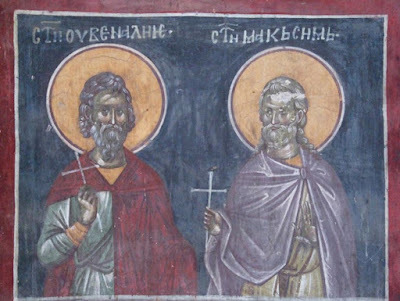 Saints Juventius and Maximinus were imperial shield-bearers in the army of Julian the Apostate (361-363), from Antioch in Syria, who were martyred because they were overheard during a military drinking party decrying the emperor's edicts in restoring pagan sacrifices during a campaign against the Persians. Called before Julian, they were stripped of their estates, scourged, and beheaded when they refused to recant and sacrifice to the gods. At risk to their own lives, other Christians stole away the bodies of the martyrs and, after Julian's death in Persia the following June, erected a magnificent tomb for the relics. Saint John Chrysostom wrote their eulogy in 388 saying, "They support the Church as pillars, defend it as towers, and repel all assaults as rocks. Let us visit them frequently, let us touch their shrine, and embrace their relics with confidence, that we may obtain from them some blessing. For as soldiers, showing to the king the wounds which they have received in his battles, speak with confidence, so they, by a humble representation of their past sufferings for Christ, obtain whatever they ask of the King of heaven." "Now Julian, with less restraint, or shall I say, less shame, began to arm himself against the true faith, wearing indeed a mask of moderation, but all the while preparing gins and traps which caught all who were deceived by them in the destruction of iniquity. He began by polluting with foul sacrifices the wells in the city and in Daphne, that every man who used the fountain might be partaker of abomination. Then he thoroughly polluted the things exposed in the Forum, for bread and meat and fruit and vegetables and every kind of food were aspersed. When those who were called by the Savior's name saw what was done, they groaned and bewailed and expressed their abomination; nevertheless they partook, for they remembered the apostolic law, "Everything that is sold in the slaughterhouse eat, asking no question for conscience sake." No sooner did he whom sympathetic courtiers call 'most mild' and 'most philosophical' hear these words than he took off his mask of moderation, and exposed the countenance of impiety. He ordered cruel and painful scourgings to be inflicted on them and deprived them of their lives; or shall we not rather say freed them from that sorrowful time and gave them crowns of victory? 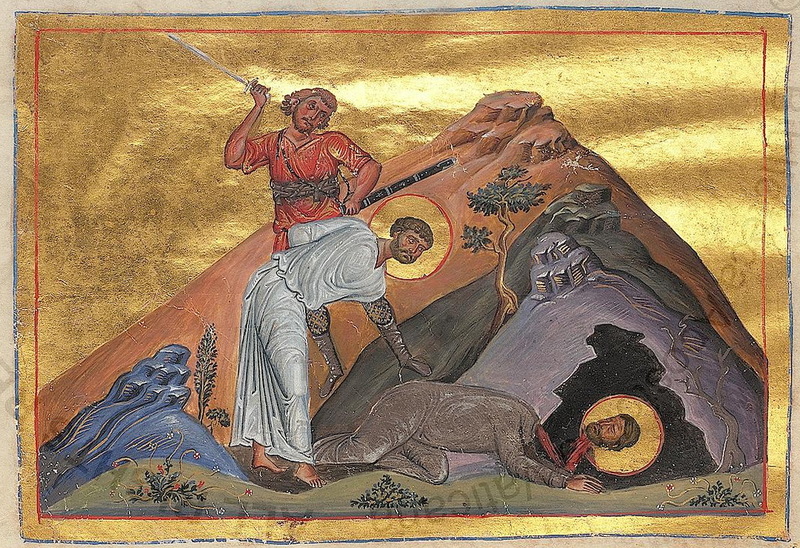 He pretended indeed that punishment was inflicted upon them not for the true faith for sake of which they were really slain, but because of their insolence, for he gave out that he had punished them for insulting the emperor, and ordered this report to be published abroad, thus grudging to these champions of the truth the name and honor of martyrs. The name of one was Juventinus, of the other Maximinus. 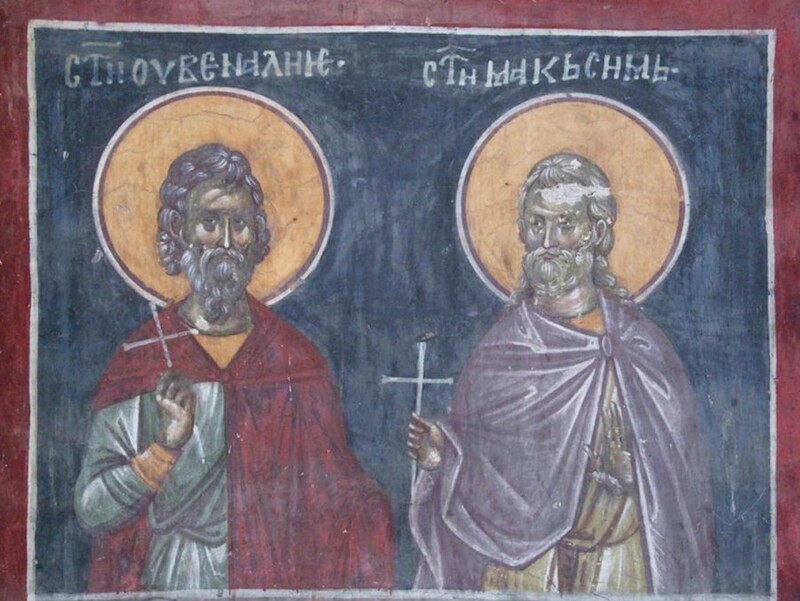 The city of Antioch honored them as defenders of true piety, and deposited them in a magnificent tomb, and up to this day they are honored by a yearly festival. Other men in public office and of distinction used similar boldness of speech, and won like crowns of martyrdom."